Are you in the process of renovating your entire kitchen? Are you simply interested in swapping out your old faucet for a new one? It doesn’t matter why you want to install a new kitchen faucet, you need to realize one thing: there are hundreds upon hundreds of styles to choose from. You’ll find kitchen faucets for less than $50, as well as those for $500 or more. What are you comfortable spending? Spout height. This is primarily a matter of taste, but you also need to consider what will look best and what will fit in your space. Number of holes in the sink. You don’t want to buy a faucet that requires three holes, when you only have one in place. Pull down or traditional sprayer. Some people like a pull down sprayer, while others prefer a traditional model as they’re most familiar with this style. Again, this is a matter of preference. 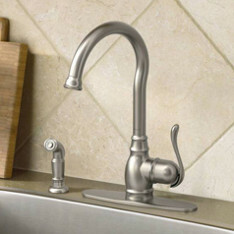 With these tips guiding you, you’ll find it much easier to choose a kitchen faucet. From there, you can turn your attention to the installation process. If you need any help along the way, don’t hesitate to contact us. We’re here to provide you with the assistance you require.